This month, Brooklyn’s P.S. 261 unveiled a new green playground designed to absorb storm water runoff and thereby prevent flooding from the Gowanus Canal. Courtesy of New York City and the Trust for Public Land, the yard will help prevent the 300 million gallons of overflow witnessed every year from entering the waterway. The playground is one of forty planned for the city, to assist in reducing the impact of storms on New York’s infrastructure and habitats. Students offered their input with regard to the design of the P.S. 261 playground, and among its attributes are an outdoor classroom, a storage shed with green roof, a rain garden with catchment barrels, porous concrete pavement, artificial turf field, and an open play space. 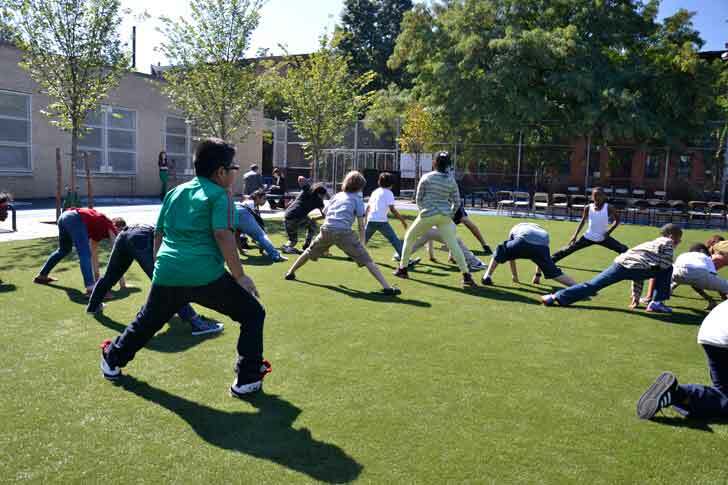 In addition to being a means to control flooding and improve the health of the city’s waterways, the yard serves as an introduction to nature and it is a dynamic setting for learning. Two other playgrounds are scheduled to be completed this year at J.H.S. 218 in East New York and P.S. 65 in Brooklyn. Other older asphalt playgrounds are expected to be retrofitted as a result of Mayor Bloomberg’s PlaNYC 2030 initiative. Already, 221 schoolyards have been opened to the public after hours, and 345 school gardens have been established. A number of organizations have joined the Trust for Public Land in their effort to swap blacktop for trees, planted beds, and fields in order to address flooding and the health of the city’s streams and rivers. 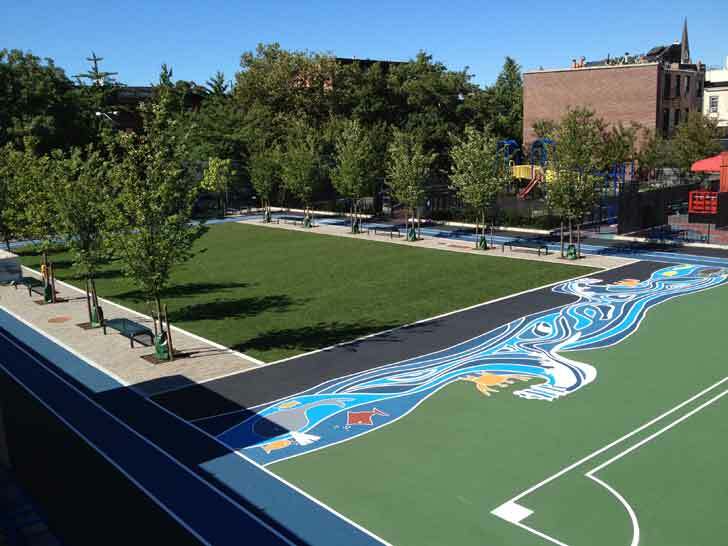 So far, the TLP has constructed 178 playgrounds across the five boroughs. Funds for the million dollar playground were provided by NYC Department of Education, Councilmember Charles Barron, Speaker Christine Quinn, Japan’s Mizuho Bank, Ltd., MetLife, the Department of Environmental Protection, and the Trust for Public Land. This month, Brooklyn's P.S. 261 unveiled a new green playground designed to absorb storm water runoff and thereby prevent flooding from the Gowanus Canal. Courtesy of New York City and the Trust for Public Land, the yard will help prevent the 300 million gallons of overflow witnessed every year from entering the waterway. The playground is one of forty planned for the city, to assist in reducing the impact of storms on New York's infrastructure and habitats.